Learn what test criteria to use for split testing and what components are acceptable to test. You've set up your split test by giving it a name and campaign. It is now time to determine what to split test. Under Test Criteria, you have the option to choose from the below settings. You can click on any of the links to skip to that specific section. 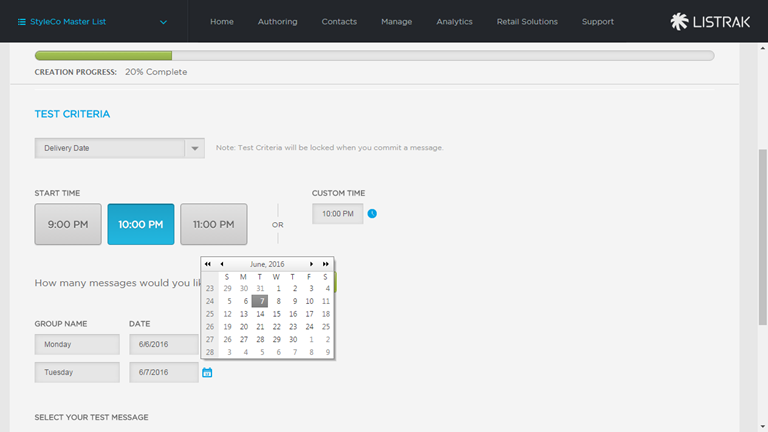 Delivery Date: Sending messages at a specific time on multiple dates. Delivery Time: Sending messages on a specific date at varying times. Subject Line: Sending the same message with multiple subject lines. Message Content: Sending different email content altogether to test recipients. From Name/Email Address: Sending the same message with a different from name or email address. NOTE: Regardless of which test criteria you choose, you can do up to a 10-way split test. Our recommendation, however, is to adhere to an A/B or two-way split test. If you want to send a split test to multiple groups of people across multiple days and see which day gets the better results, use Delivery Date. Select Delivery Date from the Test Criteria drop-down menu. Select which time you'd like the messages to go out on each date. 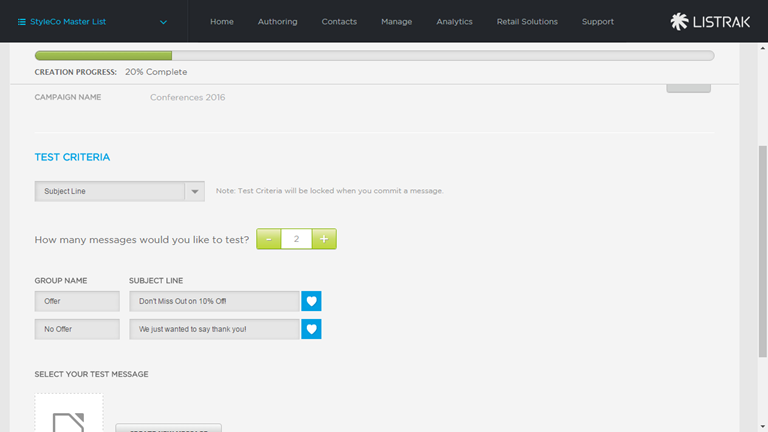 Select how many messages you'd like to test. For each test, give each group a name and specify the date you'd like the message to go out on. If you'd like your message to go out on a certain day, but want to see if a certain time frame performs better than another, use Delivery Time. Select Delivery Time from the Test Criteria drop-down menu. Select which Date you'd like the messages to go out on. For each test, give each group a name and specify the time you'd like the message to go out. If you want to see which subject line performs best, use Subject Line for your test criteria. Select Subject Line from the Test Criteria drop-down menu. For each test, give each group a name and specify the subject line you would like to give each group. If you have multiple messages that have varying content that you'd like to split test, use the Message Content split test. 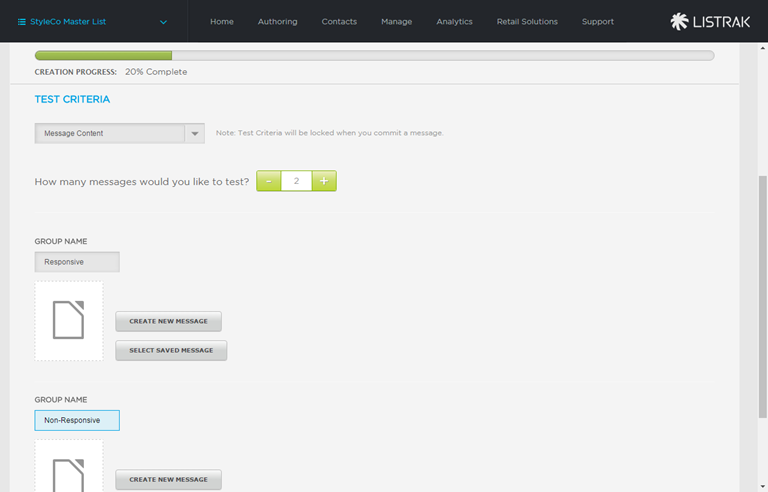 Select Message Content from the Test Criteria drop-down menu. For each test you'd like to run, give each group a name and then add the content to each group. NOTE: The next article in the series will discuss how to add messages to your split test. If you'd like to test which "from name" or "from email address" produces better results, use the From Name/Email Address option. Select From Name/Email Address from the Test Criteria drop-down menu. 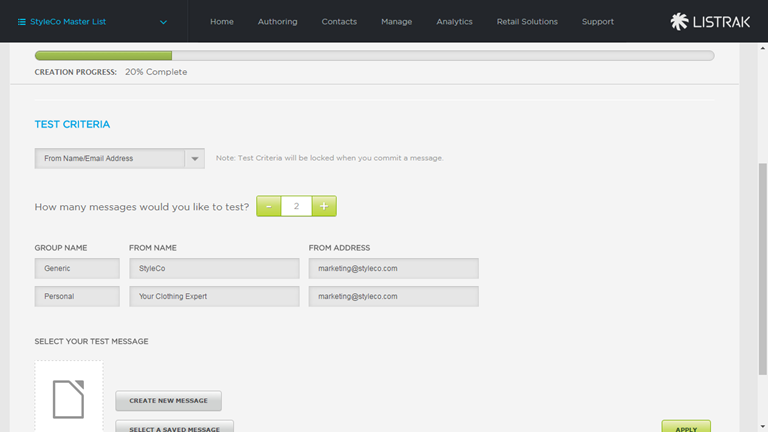 For each test you'd like to run, give each group a name and then add a from name and from email address to each group.